Avoid unexpected bills by knowing how to prevent unauthorised in-app purchases on your smartphone or tablet. Mobile apps are often available to download free in an online store but sometimes require significant in-app purchases to maximise the experience of the app. In-app purchases may include paying to use an ad-free version of the app, buying extra lives in a game, or paying to access extra content. Not all apps sufficiently disclose at what point the user is making an in-app purchase. In particular, children using their parent’s device may not realise the in-app purchases are spending their parent’s money in the real world. Apple and Android devices require authentication before making a purchase in the online store. Once this is entered additional purchases can be made for 15 to 30 minutes without requiring authentication. During this time users can make several purchases without realising that they are being charged. use gift cards instead of credit cards to minimise the amount of money spent. 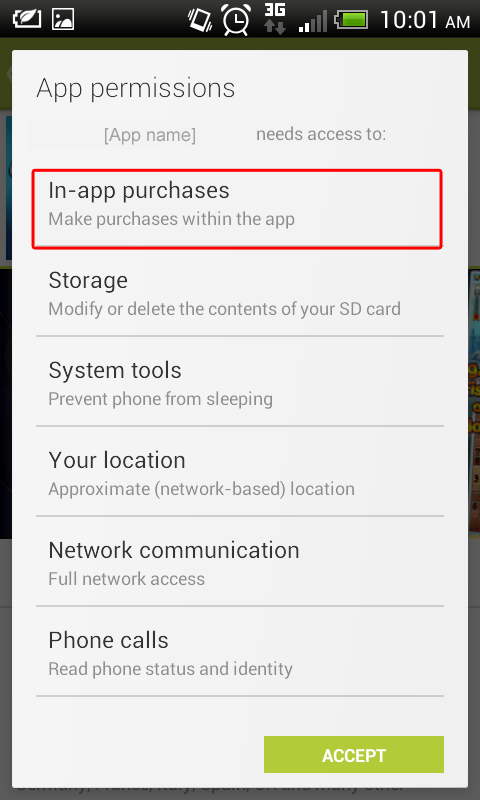 You can choose to either turn-off in-app purchases completely, or require a pass-code for every in-app purchase. NOTE: Users of iPhone 5s or above devices also have the option of fingerprint recognition called ‘Touch ID’, which can be used to authorise purchases from the iTunes Store, App Store, and iBooks Store. 5. Select For all purchases through Google Play on this device, when prompted enter your password and tap OK. In addition, you now have the option to see whether an app contains in-app purchases before making a decision to install the app. contact your mobile phone provider about unauthorised charges appearing on your bill. If you have a dispute about charges that you can’t resolve with your service provider, contact the Telecommunications Industry Ombudsman.